The Strobe 16 is a significantly more powerful light barrier than the Strobe 10. The effect of the 2,700W bulb is dramatic - the flash output is highly disruptive and is extremely difficult to deal with - so much so that it even penetrates closed eyelids, and can temporarily "burn" a white spot into the intruders vision. The resultant effect is very destabilizing and disorienting when combined with an Inferno sound barrier. The extreme power of the strobe demands a 16A fuse, which in some cases may require the intervention of an electrician - to ensure that existing mains wiring is capable of delivering the required current. 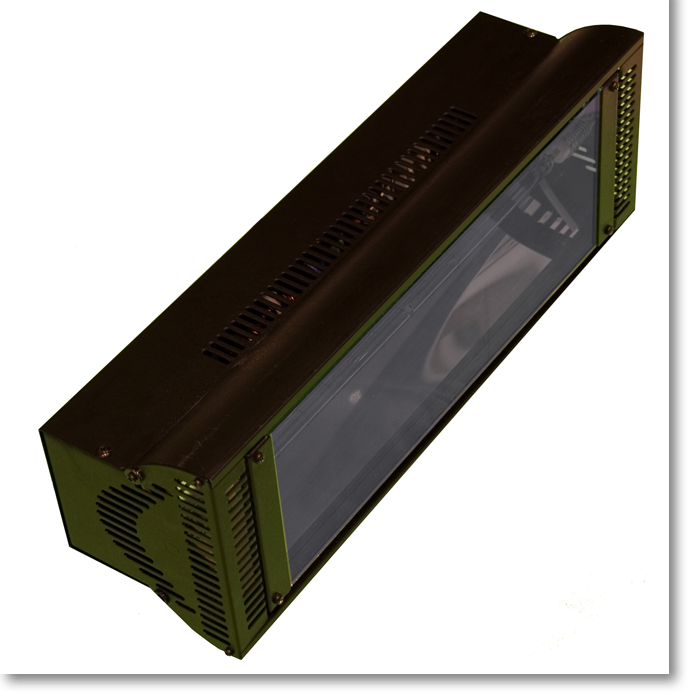 As with the Strobe 10, the Strobe 16 is suitable to a huge range of security applications, ranging from retail premises to storage facilities. It too is most often installed in tandem with a sound barrier in order to create sensory overload and render the intruder's attempt a failure. The aesthetics and smaller size of the Strobe 16 are such that it does not look out of place in high end retail environments. Download the Strobe 16 data sheet with complete technical specifications.